Daksha was Lord Brahma’s son. He had a lovely daughter who he called Sati. Sati was a great devotee of Shiva. She used to meditate on Lord Shiva for hours even as a child. As she grew up her love for Shiva increased further. Pleased by her prayers and penances, Lord Shiva appeared before her and asked her to be his consort. This was what she had always wished. She agreed to marry him. Lord Shiva asked Brahmaji to talk to Daksha about his wish to marry Sati. 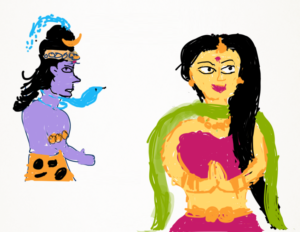 As Brahmaji told Daksha that Shiva would be a good match for Sati, he agreed and the wedding was arranged. All the Gods came to bless the couple. Shiva and Sati left for Kailash, their, abode. Once Daksha went to Kailash to invite Sati and Shiva for a yagna organised by him. Shiva was deep in meditation and failed to notice Daksha, so he left angrilly without inviting them. Soon the day of the sacred ceremony arrived. As Sati came to know about it she wondered why her farther did not invite them for the same. She asked Shiva and went to Daksha’s house. She felt hurt when she saw every one except she and her Lord Shiva were invited and present there. She was sad and upset too. Her father saw her but did not welcome her. As Sati moved towards her farther and questioned him why they were not invited for such a grand ceremony, her farther started talking rudely about Lord Shiva. Sati was furious and plunged into the sacrificial fire. Out of shock and anger she immolated herself. As Lord Shiva heard about this he was in great sorrow and anger. He plucked a cluster of his hair and created a demon named Virabhadra. Virabhadra ruined the sacrificial ceremony and killed Daksha. Lord Shiva went there picked Sati’ s body and started to perform the, Tandava nritya , dance of destruction. All the Gods were frightened and went to lord Vishnu for rescue. Lord Vishnu sent his Sudarshan Chakra and cut Sati’s body into pieces. All these pieces fell here and there at several places and turned into sacred sites of worship. Lord Shiva then calmed down. Soon Sati was reborn as Parvati, who later became his consort and were re- united.